In the night, eyes reflect light in a way that can make your skin crawl. Fox have orange eyes. Possums do too. The dog has white eyes, and so do the cows. Even the chickens eyes reflect white. 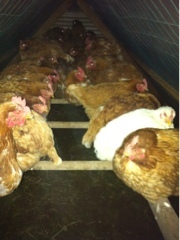 At night the laying hens settle into their roosts, snugged up to each other. 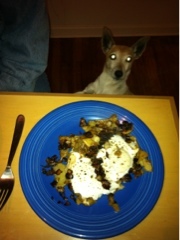 Sandi begs for a bite of a delightful farm meal: onions carmelized, potatoes cooked to tender, eggs steamed on top. Time enough to make thought out meals now, not just rushing to shovel in food. We have the opportunity to enjoy and savor the cooking and eating process. Even with all those eyes on us.